They exist. There has been much controversy on the subject almost as much as the old "Candian block". While I know Eddie Wood had a significant influence in the YellaTerra heads there was no "proof" other then word of mouth. However Harv tracked down some information on the YellaTerra grey motor which can bee seen here. Harv provided permission to re-post this information. "I was wrong. Really wrong. :oops: I believed that there was no such thing as a Holden grey motor Yella Terra head. I thought many of the heads seen on the market were "Dulux overhauled" with a yellow rattle-can. There actually was (is) a grey motor Yella Terra head. Maybe my search skills got better with all this Guide writing, or maybe more info has come to hand in recent years. In any case, apologies to anyone I’ve blown raspberries at for claiming they had a Yella Terra head... they just may have. As penance for my error, I’ve started this thread. I’m not writing a Tella Terra Guide... I’ve got enough on my plate as it is. The aim of this thread is to collect together the evidence supporting the Yella Terra grey motor head. I seem to collect grey motor info as I go along, so will post what I find here. We will probably touch on the red motor as we go along. Where possible, please back up your posts with support material – photos, scans of advertisements etc. I know this sounds finicky, but the Yella Terra head has been a bit like the Canadian block... so surrounded in “I once knew a bloke” stories that it is hard to sort the wheat from the chaff. From the Perfectune website (http://www.perfectune.com.au/), Perfectune was established in 1962 by Dave Bennett. This was still in the years of the grey motor, with the red appearing a year later. Perfectune was the first engineering company in Australia with CNC machining capabilities. During the late 1970’s to the mid 1980’s, the company was a supplier to Holden for OEM engine components. During this time Perfectune launched Yella Terra as a brand of high performance racing parts. The brand continues in use today (http://www.yellaterra.com/). 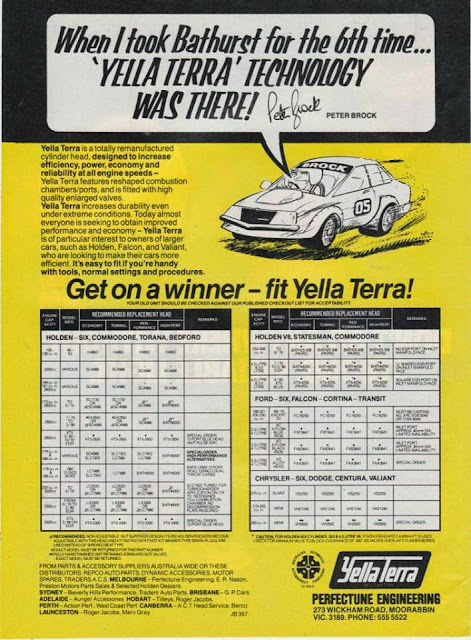 Now for the evidence that the grey motor Yella Terra existed. 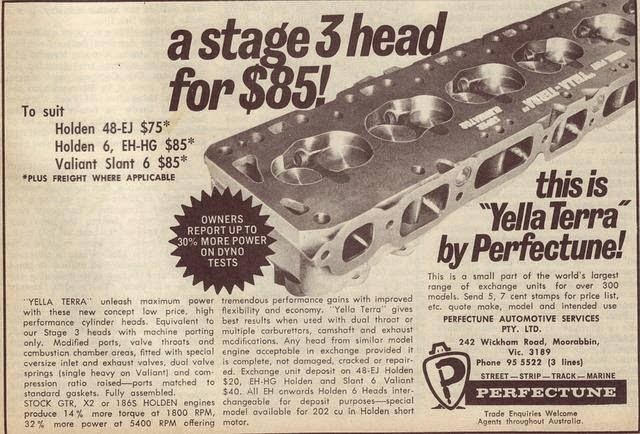 The ads below (the first from the Australian Motor Manual magazine of November 1972, the second from an unknown source in 1972) shows that Perfectune would take your grey motor cylinder head with a $25 exchange deposit in case your exchange head turned out to be unrecoverable. They would then machine and fit components (valves etc) to your head. 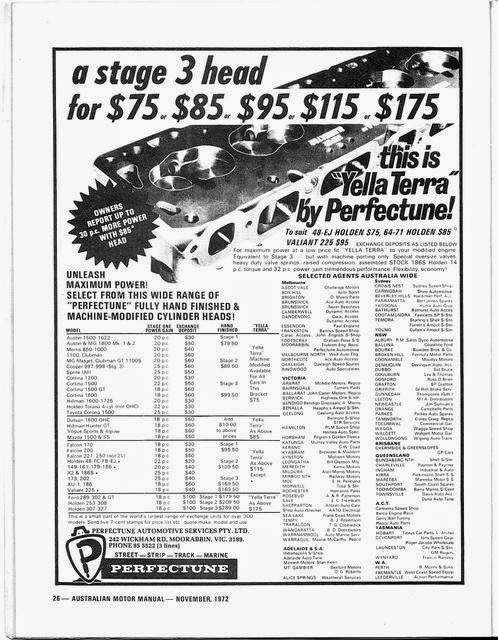 They offered a Stage 1, Stage 2 and a Stage 3 (Yella Terra) option for between $85 and $175. The ad clearly tables the Stage 3 head for the grey motor as a Yella Terra (stage 1 and Stage 2 were not). Stage 1 gave a 22% power increase (the stage 3 on a 186S red motor head was giving 32%... no data reported for the grey motor Stage 3). The Yella Terra (Stage 3) was machine ported, had modified ports, valve throats and combustion chambers, oversized inlet and exhaust valves, double valve springs, compression raised (shaved) and ports matched to standard gaskets. To Add to that here is a Greymotor Yella Terra head running. This motor in in Melbouren Victoria as on today.